On our trip to Groton to see the Mystic Schooners were found a BAM! (Books a Million) and there I found these first issues of Gwenpool. I would say that my connection to Gwenpool stems from the fact that she has Howard the Duck on the cover of this issue and for the most part he is a lead character in this issue as well. I would leave it open to the reader to decide whether or not Howard or Gwenpool is the sidekick in this story but I like to think of it more as they are a crime-fighting duo. So, this story revolves around Black Cat asking Howard the Duck for help finding Gwenpool when Howard is already hiding her because she stole a virus from Black Cat and then sold it to Hydra which in turn leads to Gwenpool and Howard stealing it back so that it can't be used for evil. Basically, when this issue first starts Gwenpool isn't necessarily evil but just sort of innocent and naive still where she's not sure which is the good side and which is the bad side, but by the end she starts shaping into a good guy. Gwenpool has this simple side to her but she also comes from an alternate universe, as her backstory is explained in bits and pieces throughout the issue and is never fully revealed quite yet anyway. I will still always go back to an interview I read with Gerard Way about Umbrella Academy where he said too many people these days needed answers and backstories when it used to just be accepted in comic books that certain things were the way that they were. I feel like Gwenpool has that quality of people might not get it because it doesn't offer a lot of explanation, but at the same time it's one of the things I love most about it. I purchased the first three issues of Gwenpool from BAM! (#0, #1 and #2) and so as I read the next two I will decide whether or not to keep going and thus search out the next issues to purchase online and the such. But as of right now, just based on this issue, I'm really enjoying the way this is going and the possibilities of where it can go. 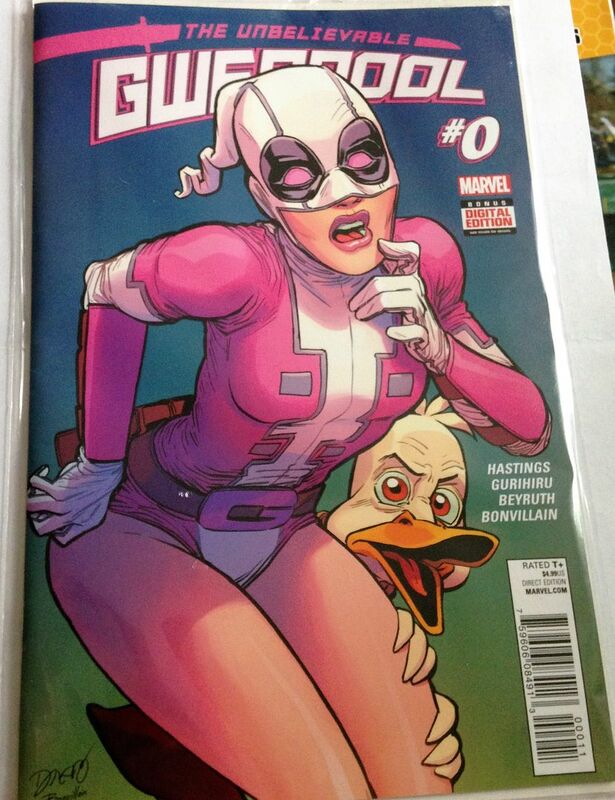 Gwenpool can crossover with various characters (I really want to see her, Howard and Spider-Man in the same issue) and as much as I love Howard the Duck (quite possibly my favorite comic book character right now) I wouldn't even mind if eventually Gwenpool existed without him. From the little things- like Gwenpool coming from a universe where Howard the Duck is a comic book character and him saying he will die results in her saying they'll just bring him back as they've done before- to the fact that Howard the Duck is in a lot of ways ushering in this character for me, I think Gwenpool is one of my new favorite series and I plan on sticking with it if these next two issues don't take a turn for the worst. Besides, whenever someone at work now tells me to do something other than what I'm doing I'm going to now tell them it's like a special crossover issue.